Slide-out drawer accommodates firearms, jewelry, documents, and more. Digital lock with key backup can be programmed with 3 to 8 digit access code. Pry-resistant door keeps children and unauthorized users from gaining access. Constructed of 14-gauge heavy-duty steel, with pre-drilled holes for permanent installation. Robust 5-foot cable provides added security when anchored to a stationary object. Security that fits your space, wherever you rest or roam. 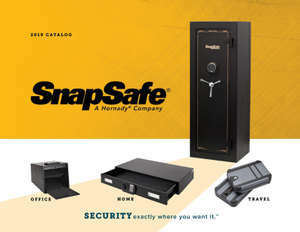 Whether at home or on the road, SnapSafe has a variety of solutions to secure everything from medications to electronics, firearms to documents. The Under Bed Safes and Trunk Safe keep your valuables secure and away from prying eyes.